A three-ingredient cheesecake has sent social media users into overdrive, with the recipe earning over 1.6 million views. Posted by YouTube user Ochikeron over two years ago, the recipe for a Japanese souffle cheesecake recipe has reignited attention due to its simple ingredients and easy preparation. Ochikeron transforms just three everyday household ingredients – three eggs, dark or white chocolate and cream cheese – into an impressive looking (and healthy) dessert cake. Directions: 1. Preheat the oven to 170C (338F). Separate the eggs and place the whites in a large bowl. Let your egg whites sit in the refrigerator to keep them cold until you are ready to use them (which makes the meringue more stable). 2. Place the chocolate (broken into pieces) in a large bowl. Melt the chocolate in a double boiler over hot water (60C/140F). Then add the cream cheese and melt them together. Remove the bowl from the double boiler, add the egg yolks, and mix well. 3. In a large bowl, whip egg whites with an electric mixer until firm peaks form. *If it’s thick enough, you can turn the bowl upside down without it sliding out. 4. Add 1/3 Meringue into the cream cheese batter and blend well with a spatula. Then add the rest of the Meringue 1/2 at a time and mix well. 5. Rub some oil/butter on parchment paper (in this way, the cake can slide down when it shrinks, so you can prevent the cake from cracking). Line the round cake pan with the parchment paper. Pour the batter into the pan and drop the pan lightly on the counter to raise the air bubbles out of the batter. 6. Place the cake pan on a baking sheet. Pour some hot water into the baking sheet. Bake at 170C (338F) for 15 minutes, 160C (320F) for 15 minutes, then stop the heat and bake with the remaining heat for 15 minutes. 7. When it is done, place the cake pan on a wire rack to cool completely. You can brush the cake with some apricot jam syrup and/or dust with powdered sugar (confectioner’s sugar) to finish. You can serve it with whipped cream if desired. Before you go to clean he grill before your next cookout, keep this horrifying news in mind. 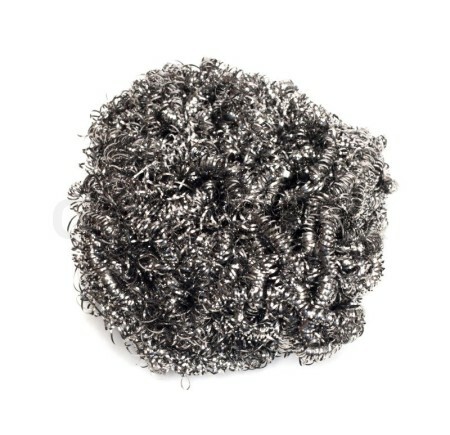 Doctors warn that using wire bristle brushes could be hazardous to your health. The risk: The brush’s wire bristles can break off, remain on the grill grate and end up in the food you’re cooking. Then, once you eat it, they could potentially lodge in your stomach or intestines and cause major damage. A CT scan showed a foreign object and she had to undergo emergency surgery to remove an inch-long piece of metal from her intestine. Her husband had cleaned their grill with a wire brush before cooking, and Harrison had unknowingly ingested a bristle in her burger. Unfortunately, her situation isn’t uncommon. Last summer, a Connecticut girl named Anna Dunn had surgery to remove a wire from her throat after eating a hot dog at a picnic. The liver, weighing in at about 3 pounds in healthy adults, is one of the body’s vital organs. It is responsible for many important functions related to digestion, metabolism, immunity and the storage of nutrients that the body needs to survive. Moreover, the liver is a gland that secretes chemicals required by other parts of the body. In fact, the liver is the only part of your body that is both an organ and a gland. A healthy liver regulates the composition of blood, removes harmful toxins from the blood as well as processes and converts nutrients absorbed by the intestines during digestion into forms that the body can use. It also stores some vitamins, iron and simple sugar glucose. It is also responsible for breaking down insulin, hemoglobin and other hormones. In addition, it destroys old red blood cells and produces chemicals needed for blood to clot properly. Because the liver performs so many vital functions, it is important to keep it healthy. An unhealthy diet and poor lifestyle can overwork and overload the liver, leaving it unable to process toxins and fat efficiently. This in turn can raise the risk of obesity, cardiovascular disease, chronic fatigue, headaches, digestive problems, allergies and many other health problems. 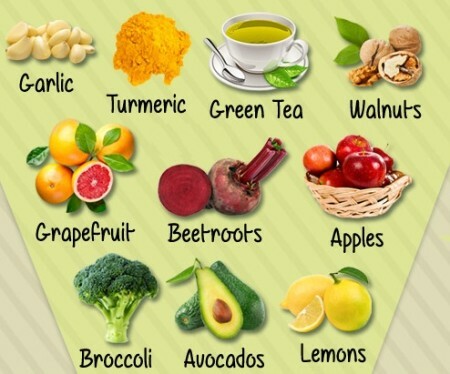 Many foods can help cleanse, rejuvenate and detoxify your liver. This will help keep your liver healthy and functioning the way you need it to. Garlic Garlic is great for cleansing your liver. It helps activate enzymes in the liver that help clear out toxins. It also contains two natural compounds called allicin and selenium, which aid in the liver-cleansing process and protect the liver from toxic damage. Moreover, garlic reduces cholesterol and triglyceride levels, which can overload the liver and hamper its functioning. To promote liver health, use fresh raw garlic instead of processed, minced garlic or powder. Eat 2 to 3 raw garlic cloves daily and include garlic in your cooking whenever possible. You can also take garlic supplements, but only after consulting your doctor. Grapefruit Being a good source of vitamin C, pectin and antioxidants, grapefruit also aids the natural cleansing process of the liver. It also contains glutathione, a powerful antioxidant that neutralizes free radicals and detoxifies the liver. Glutathione also helps in the detoxification of heavy metals. Moreover, the flavonoid naringenin in grapefruit helps break down fat. Drink a small glass of freshly squeezed grapefruit juice or enjoy the whole fruit with your breakfast daily. Note: If you are on medications, consult your doctor before taking this fruit as it may interact with certain drugs. Beetroots Beetroots are another powerful food for cleansing and supporting liver function. High in plant flavonoids and beta-carotene, they help stimulate and improve overall liver function. Moreover, beetroots are natural blood purifiers. Simply add fresh beetroots or juice to your daily diet. Make a powerful liver-cleansing salad with 1 cup of chopped or grated beetroots, 2 tablespoons of cold-pressed extra-virgin olive oil and the juice of ½ lemon. Mix all the ingredients together and eat 2 teaspoons of it every 2 hours during the day for a week. Lemons Lemons help detoxify the liver mainly due to the antioxidant D-Limonene present in it, which helps activate enzymes in the liver that aid detoxification. Moreover, the high amount of vitamin C in lemons helps your liver produce more enzymes to aid digestion. Lemons also boost mineral absorption by the liver. Make lemon water at home by adding the juice of 1 lemon to a jar of water. You can even add chopped lemons to it. Drink this water at regular intervals. If desired, add a little honey. Green Tea By drinking green tea daily, you can help your body flush out toxins and fat deposits, while increasing hydration levels. A 2002 study published in the International Journal of Obesity found that the catechins in tea help stimulate lipid catabolism in the liver. This in turn prevents fat accumulation in the liver. This healthy beverage also protects the liver from the damaging effects of toxic substances like alcohol. Green tea is also beneficial in treating or preventing liver disease. According to a 2009 study published in Cancer Causes and Control, people who drink green tea have a lower risk of developing liver cancer. Drink 2 to 3 cups of green tea daily. If desired, sweeten your tea with honey. Note: Avoid drinking green tea in excess as it can have an adverse impact on your liver and other body parts. Avocados Avocados contain potent chemicals that may reduce liver damage, according to a 2000 study by the American Chemical Society. This fruit is rich in glutathione, a compound required by the liver to cleanse harmful toxins and to function properly. The high amount of monounsaturated fat in avocados helps reduce low-density lipoproteins or “bad” cholesterol and increase high-density lipoproteins or “good” cholesterol. The liver easily processes good cholesterol. Moreover, avocados contain many minerals, vitamins and plant nutrients that support overall liver health and help break down fats. Eat 1 to 2 avocados per week for a couple of months to help reverse liver damage. Turmeric Turmeric is another popular and effective liver-cleansing food. It also improves the body’s ability to digest fats. The compound curcumin in turmeric induces the formation of a primary liver detoxification enzyme called glutathione S-transferase. It also helps regenerate damaged liver cells. Mix ¼ teaspoon of turmeric powder in a glass of water and boil it. Drink it twice daily for a couple of weeks. Also, include this spice in your daily cooking. Apples An apple a day is the secret behind a healthy liver. Apples are a good source of pectin, a soluble fiber that helps remove toxins from the digestive tract and cholesterol from the blood, in turn preventing the liver from being overworked. Moreover, apples contain malic acid, a naturally cleansing nutrient that removes carcinogens and other toxins from the blood. All types of apples are good for your liver, however, for fast liver cleansing choose organic apples. Eat one organic apple or drink a glass of fresh apple juice daily. Walnuts The high amount of the amino acid l-arginine in walnuts aids the liver in detoxifying ammonia. Moreover, walnuts contain glutathione and omega-3 fatty acids, which aid the natural liver-cleansing process. According to a 2008 study published in the Journal of Agricultural and Food Chemistry, walnut polyphenols prevent liver damage induced by carbon tetrachloride and d-galactosamine. Munch on a handful of walnuts as a snack daily. You can also sprinkle them over a salad, side dish, soup or baked goods. Broccoli Support the natural liver-cleansing process by including broccoli in your diet. Being rich in glucosinolates, it helps flush carcinogens and other harmful toxins out of the body. The high fiber content in broccoli also improves the digestion process. Moreover, it contains fat-soluble vitamin E, an important antioxidant for the liver to carry out its functions. Eat 1 cup of broccoli 3 times a week to keep your liver healthy. Also, to keep your liver healthy, health experts recommend eliminating or reducing animal foods as well as alcohol, refined sugar, excess caffeine and processed foods from your diet. In addition, stop smoking as it causes significant damage to different organs of the body, including the liver. Ingredients 2 oz whole-wheat spaghetti 1 tsp olive oil 1 tbsp onion, chopped 1 to 2 garlic cloves, minced 2 tbsp white wine 1⁄2 cup shrimp, cooked 2 tbsp fat-free half-and-half 1 tbsp parmesan cheese, freshly grated 1 tbsp fresh flat-leaf Italian parsley, chopped 1 black pepper, freshly ground, to taste Directions Prep 15 min Cook 10 min Ready 25 min Bring a pot of salted water to a boil and cook spaghetti according to package directions. Drain, reserving 1 tablespoon cooking water, and set aside. While pasta cooks, heat olive oil in a skillet over medium high heat. Add onion and garlic and saute until the onions are translucent, about 3-4 minutes. Add white wine and simmer until the alcohol evaporates, about 2 minutes. Stir in reserved pasta cooking water, shrimp, and half-and-half and cook until shrimp are heated through, 2-3 minutes. Add spaghetti and stir to coat. Sprinkle with parmesan cheese, parsley, and black pepper. According to the US Department of Agriculture, there are two types of bacteria that cause problems. Pathogenic bacteria leads to food-borne illnesses, and spoilage bacteria changes the way foods look, smell, and taste. When food develops dangerous levels of pathogenic bacteria, it could look, smell, and taste normal while still being dangerous. But when spoilage occurs, something can taste gross but won’t necessarily make you sick. Confusing, right? Here’s a list of 31 items that will do just fine outside the fridge. Potatoes: When too cold, starches found in potatoes turn to sugar, yielding an off flavor. Keep potatoes stored in a paper bag in a cool, dark cupboard or drawer. Same goes for sweet potatoes. Honey: Your luscious honey will turn to crystallized gunk if it is stored in the fridge. Store it at room temperature and out of direct sunlight for happy honey. Tomatoes: Tomatoes actually start losing their flavor and become quite mushy if left in the fridge. Leave on the counter and use when they have a slight give to the outside skin. Apples: Apples, just like tomatoes, start to loose flavor and texture after spending time in the fridge. Leave them on the counter, and toss them in the fridge for 30 minutes prior to eating if you want a crisp bite. Onions: The best place for onions is in a paper bag in a cool, dark cabinet or drawer. 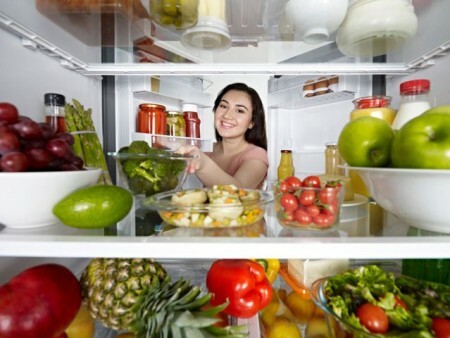 If stored in the fridge, they soften and impart an oniony scent on nearby foods. Peanut butter: Peanut butter does just fine stored in a cool, dark cupboard. Bread: You might be tempted to store bread in the fridge, but it actually dries out faster. Instead, store it in a cool cupboard or bread box for a fresh slice. Bananas: Leave those bananas on the counter, and if they turn brown before you get to them, toss them in the freezer to make banana bread at a later date. Most oils: Pretty much all oils are safe to store at room temperature. If the oil has a lower saturated-fat content, such as safflower or sunflower, it will benefit from being kept cool, so store it in a dark cabinet or the fridge door. Avocados: Store avocados on the counter and any leftovers in the fridge. But they’ll lose flavor, so it’s a good idea to use a whole one when making the cut. Peppers: Red, green, yellow, and even chili peppers are just fine stored in a paper bag in a cool cupboard or drawer. Winter squash: Acorn, spaghetti, and butternut do best when stored at room temperature. Citrus: Store oranges, lemons, and limes at room temperature on your kitchen counter. Just be careful not to bunch them too closely, or they will tend to mold. Berries: Fresh berries already have a short shelf life, so leave them out of the fridge and eat them within a day or two of purchasing. Melons: Most melons do best outside the fridge. Once refrigerated, they tend to break down and become mealy. After cutting, if any are remaining, store them in the fridge. Ketchup: Yup, your ketchup is just fine in your pantry — even after it has been opened. Because of the amount of vinegar and preservatives, it will do just fine (think ketchup packets at your favorite fast-food restaurant). Jam: Due to the high amount of preservatives in jams and jellies, they are also OK to store in the pantry after opening. Stone fruits: Stone fruits aren’t friends of the fridge, so leave them on the counter until they’re ripe, and then eat. Pickles: Another item high in preservatives, mainly vinegar, pickles will stay crisp in the pantry. But, if you’re a fan of cold ones, store them in the refrigerator door, which leaves the coldest spots of the fridge for items that really need the space. Garlic: Store garlic in a paper bag in a cool, dark spot, and it holds its wonderful flavor for weeks. Hot sauce: Make more room in your fridge, and store hot sauce in your pantry — even after it has been opened. All the preservatives and spices keep it safe for topping your eats. Spices: Ground spices do not need to be refrigerated. Ever. Coffee: Many think coffee deserves a special place in the fridge or freezer, but it actually is best at room temperature so its natural oils can really flavor your favorite cup of joe. Buy in small batches for really fragrant, and rich, morning coffee. Soy sauce: Yes, there is more than enough natural preservatives (salt) in soy sauce for it to remain safe if stored at room temperature. Some salad dressings: Just like other condiments, most salad dressing, especially ones that are vinegar- or oil-based, are just fine stored outside the fridge. Cream-, yogurt-, or mayo-based dressings should be stored in the fridge. Nuts: Nuts are just fine stored in a cool, dark spot. Dried fruits: No need to refrigerate. Nope. Cereal: Cereal is wonderfully happy in the pantry. Vacuum-packed tuna: You might not be sure, but that tuna has been sealed, just like in a can, so it’s more than fine stored at room temperature. Herbs: If you pick up fresh herbs from the grocery store, instead of stuffing them back in the suffocating plastic bag, place them in a water-filled glass jar on your kitchen counter, creating an herb bouquet to use while cooking. Real maple syrup: As with honey, that maple syrup will crystallize and get goopy if stored in the fridge. 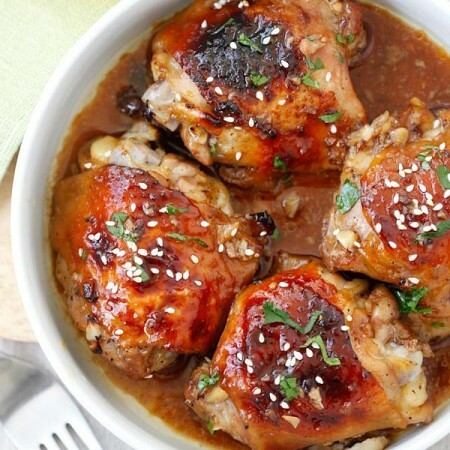 Few other braised meats can achieve the richness and depth of braised lamb shanks. This recipe seasons the braising liquid with spices associated with Moroccan cooking. If you can’t find the ras-el-hanout, a North African spice blend, you can substitute curry. Season the lamb shanks liberally with salt and set aside long enough for the salt to dissolve, at least 15 minutes. Put enough flour for dredging the shanks into a plastic bag. Add the shanks and coat with the flour. In a Dutch oven or other heavy ovenproof pot, add enough oil to reach 1/4-inch up the sides and heat over high heat. When the oil is hot but not yet smoking, shake any residual flour off the lamb shanks and sear them until they have a nice crust. Remove to paper towels to drain. Wipe out the pot, add a thin film of oil, place over medium high heat and sauté the onion and garlic until the onion develops some color, about 10 minutes. Add the cumin, coriander, cayenne, ras-el-hanout (if using), cinnamon, and half of the lemon, and stir to cook the spices and coat the onion, about 1 minute. Nestle the shanks in the pan, add the tomatoes with their liquid, and bring to a simmer. Cut out a round of parchment/baking paper that will fit your pot. Press this paper lid onto the shanks or cover the pot with a lid, placing it slightly ajar. Set the pot in the oven. Cook the shanks until they are fork tender, about 3 hours. Remove the pot from the oven and let the shanks cool to room temperature. Refrigerate until thoroughly chilled. Remove the congealed fat on the surface and discard. Reheat the shanks over medium-low heat or in a 300°F oven, just until heated through. While the lamb is reheating, soak the remaining preserved lemon in water for 5 to 10 minutes. Serve the lamb with the sauce and garnish with the lemon and the parsley, if desired. Coconut water is the ultimate thirst quencher and offers a tasty alternative to water. This pure liquid is packed with nutrients that yield an array of health benefits. Here are 8 Benefits of Coconut Water that explain why it has become so popular: Aids in Weight-loss Efforts. The fat content in coconut water is extremely low, so generous quantities can be consumed without the fear of immediately packing on the pounds. It also suppresses the appetite and makes you feel full because of its rich nature. Picture-Perfect Skin. For those with acne or other blemishes on the surface of the skin, topical application of coconut water can go a great distance as it has the ability to clear up and subsequently tone the skin. It also moisturizes the skin from within if ingested orally and eliminates large amounts of oil. This explains why products such as facial creams, shampoos, conditioners and lotions that contain traces of coconut extract are more effective. The Ultimate Hangover Remedy. Next time you overdo it and drink more than your belly can handle, consume coconut water to settle your stomach. It will also replace those essential electrolytes that exit the body if you experience bouts of frequent urination and vomiting. Facilitates Digestion. If you constantly encounter difficulty during the digestion process, coconut water may provide a source of relief. Because of its high concentration of fiber, it aids in the prevention of indigestion and reduces the occurrence of acid reflux. Boosts Hydration. 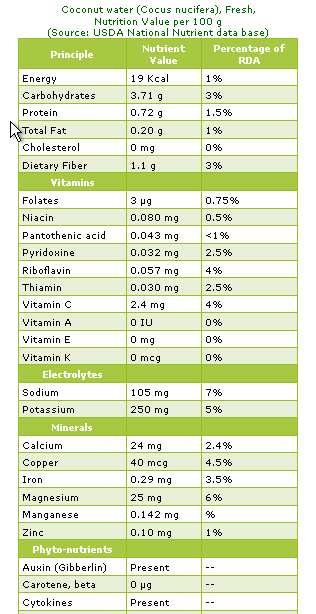 The ingredients in coconut water are way more effective at hydrating the human body than those of sports and energy drinks. During rigorous exercise or extended periods of physical activity, the human body loses mineral-rich fluids. However, coconut water serves as an excellent replacement medium with 294 mg of potassium and 5 mg of natural sugar per glass, unlike your favorite sports drink that only contains half of the potassium content and five times the amount of processed sugar. In addition, the sodium count is only 25 mg, which is relatively low compared to the 41 and 20 mg found in sports drinks and energy drinks respectively. Reduces Blood Pressure. In many instances, a disproportionate level of electrolytes can result in high blood pressure. Because coconut water contains an adequate supply of each, it can be used as a balancing mechanism. In some instances, it is recommended that coconut water be consumed at the start of each day to foster the balance of these electrolytes. Rich in Nutrients. Unlike any other beverage on the market, coconut water contains five essential electrolytes that are present in the human body. These include: calcium, magnesium, phosphorous, potassium and sodium. Because of its unique composition, coconut water can be enjoyed by individuals with varying medical conditions. Compatible with Human Blood. Since it is isotonic to human plasma, coconut water can be used in extreme emergencies to quickly rehydrate the human body if administered intravenously. It is not uncommon for the drink to be used in poorer, third-world countries to save human lives. How Much Should You Consume? Coconut water can be enjoyed as a stand-alone beverage or combined with another liquid product. There is no hard and fast rule regarding the amount that should be consumed on a daily basis, but experts from the Mayo Clinic strongly suggest that you consider maintaining an active lifestyle if consuming large amounts of coconut water since each eight ounce serving is accompanied by 45 to 60 calories. When searching for the perfect fresh coconut to enjoy, be sure to steer clear of those that have a hard brown shell as this is an indication that it is mature. Instead, look for those that are young and green on the exterior as they usually contain a large supply of the actual coconut water substance. To test it out, simply shake the coconut up and down to gauge how much liquid it contains. After “what’s your favorite ice cream?”, the question I get asked the most as an ice cream maker is “what makes gelato different from ice cream?” How does gelato get that soft, elastic texture and slow-to-melt milkiness compared to ice cream’s richer, creamier body? It comes down to three factors: fat, air, and serving temperature. The more complicated answer? Things aren’t always clear cut: this is food, not phylogeny, so individual recipes can blur the lines between the two. But there are some basic differences to keep in mind. How Ice Cream Works All ice cream is mostly water, and as water freezes, it forms hard, crunchy ice crystals. Besides great flavor, the ultimate goal of ice cream making is to keep those crystals as small as possible through added ingredients and technique. Here’s how ice cream makers fight crystallization: Emulsifying fat into a base (or using already emulsified ingredients, like cream and milk) sticks fat molecules in between water molecules, literally getting in the way of ice as it freezes. Sugar also forms a physical barrier to crystallization, just like fat. When dissolved in water, it forms a syrup with a lower freezing point than plain water, and the sweeter a syrup is (i.e. the higher the concentration of sugar), the lower the freezing point becomes. As water starts to freeze in a syrup, the unfrozen water becomes, in effect, a more concentrated syrup. This process continues until you have a bunch of small ice crystals in a sea of syrup so concentrated that it’ll never really freeze. Air is incorporated into ice cream during the churning process. Just like a light, fluffy angel food cake is easier to cut into than a dense fruit cake, a more aerated ice cream is easier to scoop, and has a fluffier, less dense texture. The temperature ice cream is stored at also has an obvious effect: colder ice creams are harder and more solid, while warmer ones are softer, with a looser texture. There are some other tricks to keep ice cream soft, such as alcohol, starch, protein (in egg and milk), and natural stabilizers like guar gum and carageenan, but the top four above are the big factors at play. Ice Cream vs. Gelato Compared to today’s American-style ice cream (that’s one made with egg yolks, as is basically the new standard in home recipes and commercial products), gelato has less fat in the base and less air churned into it during the freezing process. American ice creams are heavy on the cream, and have a fat content, by American labeling law, of at least 10% (considerably higher in most homemade and many premium versions). 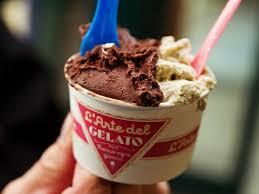 Gelato, by comparison, uses more milk than cream, so it doesn’t have nearly as much fat. Additionally, it usually—but not always—uses fewer (to the point of none) egg yolks, another source of fat in custard-based ice creams. American-style ice creams are churned fast and hard to whip in plenty of air (called overrun), which is aided by the high proportion of cream in the base. The most high-end ice creams have an overrun of 25% or so, which means they’ve increased in volume by 25%; cheaper commercial versions can run from 50% to over 90%, which gives them a light, thin, fast-melting texture that isn’t very flavorful (those bites are a quarter to a half air!). Gelato is churned at a much slower speed, which introduces less air into the base—think whipping cream by hand instead of with a stand mixer. That’s why it tastes more dense than ice cream—it is. And what about sugar? Well, sugar levels vary wildly in ice cream and gelato recipes, so there’s less of a hard difference there. If you make ice cream at home, you may be wondering about your ice cream machine: does it churn at ice cream speed or gelato speed? The truth is, most of the consumer models on the market churn at about the same speed, none of which are as fast as the commercial machines used to make American-style ice cream. But you can make both ice cream and gelato in your machine—remember, air is only one of the differences between them. All these differences give gelato a more dense and milky texture that’s less creamy than ice cream. It’s not thin, but it lacks the plush, buttery fullness of its American cousin. Some say that gelato has a more intense flavor than ice cream, since it has less of the tongue-coating cold fat that gets in the way of tasting things. But I think it’s more accurate to say that gelato’s flavors come through direct, hard, and fast, then melt away clean. A good, flavorful ice cream can have just as intense a flavor, but you’ll taste it differently. One isn’t necessarily more flavorful than the other. Temperature’s the Key So if gelato has less fat than ice cream, and less air pumped into it, why is it not as hard as a brick? How does it get that super-soft, almost elastic texture that looks like a swirl of frosting more than a scoop of ice cream? It’s the last big factor: temperature. 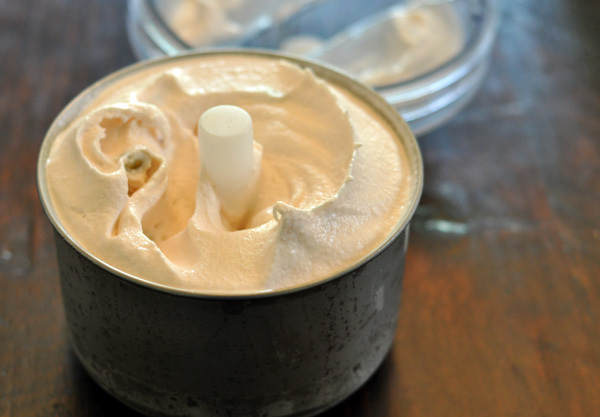 Ice cream is best served at around 10°F; gelato cases are set to a warmer temperature. If you freeze gelato really cold, it’ll turn right into the dense, relatively-low-fat brick it has the potential to be. But when warm, it’s that perfect soft-but-not-soupy consistency. If you stored ice cream at a much warmer temperature, it’d get too soupy: the high fat in water emulsion would melt too fast. A Scoop by Any Other Name I’ve been following the common naming convention in this post, calling American-style ice cream “ice cream” and Italian-style “gelato.” But here’s the thing: gelato’s just the Italian word for ice cream. Though it does stick to the tendencies I’ve pointed out above, individual recipes do vary. Some call for cornstarch, others for egg yolks; some use higher amounts of sugar and others use less. But it’s all ice cream, just how soft serve is just warmer, freshly churned ice cream, and frozen yogurt is just soft serve made with yogurt as the dairy base. Sure, we can quibble over names and definitions, but at the end of the day, it’s all one happy frozen, creamy family. We can argue about differences, or we can sit down and dig in to a pint together? I know which I’d rather do.